This is a rectangular American Marine Paint Company porcelain sign. 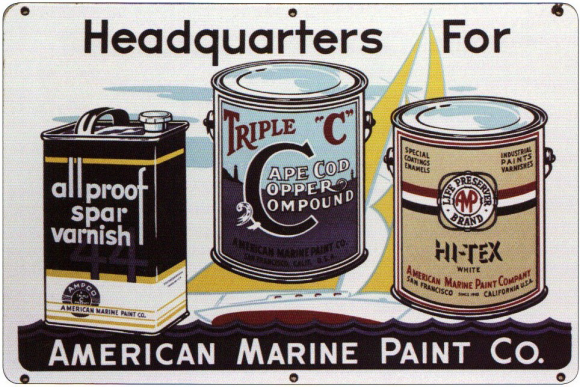 This particular American Marine Paint Co. sign features three American Marine Paint Company products against the background of a yellow sailboat. It reads, “Headquarters for American Marine Paint Co., Allproof Spar Varnish, Triple C Cape Cod Copper Compound, Hi-Tex”. This sign is predominantly white but features navy, red, yellow, and light blue.